This deliverable is part of WP3: Source Code Quality and Activity Analysis. It provides descriptions and initial prototypes of the tools that are needed for source code activity analysis. It builds upon the Deliverable 3.1 where infra-structure and a domain analysis have been investigated for Source Code Quality Analysis and initial language dependent and independent metrics have been prototyped. Task 3.2 builds partly on the results of Task 3.1 and partly introduces new infra-structure. This includes: • the extraction and analysis of the meta data of version control systems (VCS); • the development of selected source code metrics from Task 3.1 over time. The following initial measurements of VCS meta data were planned and have been executed, in the context of the SVN and GIT version control systems: • Number of committed changes; • Size of committed changes (churn); • Number of committers; • Activity distribution per committer (over files). On top of this we explored analysis of the activity in terms of certain language-specific source code metrics from the previous Task 3.1: • Number of changed, added, deleted methods and classes to experiment with language-specific activities. • Measurement of evenness of distributions (Gini coefficient) of the metrics developed in Task 3.1, for the purpose of detecting trends and spikes. The goal of these additional metrics is to start bridging the gap from code and VCS meta data metrics to the analysis requirements of the project partners. What makes WP3 in OSSMETER special is its integrated infrastructure that provides a homogeneous view on languages, analyses and metrics. We generate metrics using high level (descriptive) code in the Rascal language. In this deliverable we present: • A brief summary of motivation and challenges for Task 3.2; • A streamlined interface between the platform and the Rascal programming language; • A mapping from an object-oriented VCS deltas model to a functional VCS delta model; • Platform support for managing full working copies and source code diffs; • A description of the rationale, design and implementation of the above metrics. Vinju, J.J, & Shahi, A. (2014). 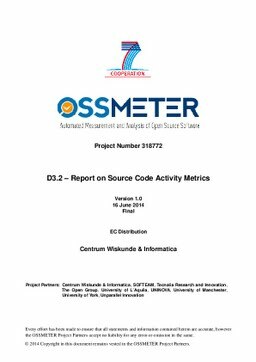 OSSMETER D3.2 – Report on Source Code Activity Metrics. CWI.